Building cement tanks for vermicomposting involves no rocket science. With some common sense, you can have them built with a local mason at a low cost. Involving an architect means two things: the cost goes up 3-4 times and they may come up with suggestions without having the basic knowledge about vermicompost. With the help of a local mesthri (mason) who had built tanks at KVK and ample support from the resident association’s Management Committee, I got three tanks built in our 15ftx15ft compost room. The size: 10ft x 3ft x 3ft. The cost: Around Rs 35,000. 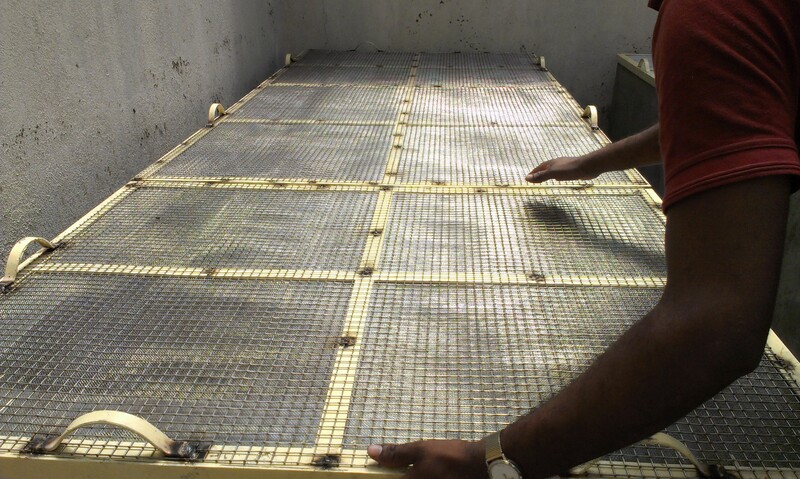 The base of the tanks has a slope to help excess water out drain out through an outlet fitted with a mesh. The mesh is necessary to prevent earthworms being washed away through it. With the help of three connectors, a single 1.5-inch pipe is connected to the tanks. All the excess water collected in this pipe flows out through a tap fitted with a valve which can be turned on and off, as required. When turned on, the water falls into a bucket placed in a small 1.5-foot-deep sump. This excess water is nothing but nutrient-rich vermi-wash. (More about that later). Secondly, you will need mesh lids for the tanks to ward off rodents and other trouble-makers. Again, with the help of a local welder, we got the lids done in just a few days. The cost: Rs 10,000 for each lid split into three parts for easy lifting and handling. Initially, a fine stainless steel mesh was welded to the lid. However, a day after we started composting, we found the mesh bitten by rodents leaving a wide gaping hole. We got one more layer of thick ½-inch stainless steel mesh laid on top the fine one. Once the infrastructure was in place, we started taking out uncooked items from the kitchen waste. Since we wanted to start off with only one tank, our housekeepers separated uncooked food from kitchen waste. Uncooked waste, a load of shredded dry garden leaves and small twigs and five bags of cowdung were mixed well in one tank, watered sufficiently and let to decompose. Within 20-25 days with a few rounds of churning, the semi-compost had turned almost black laced with earthy smell. 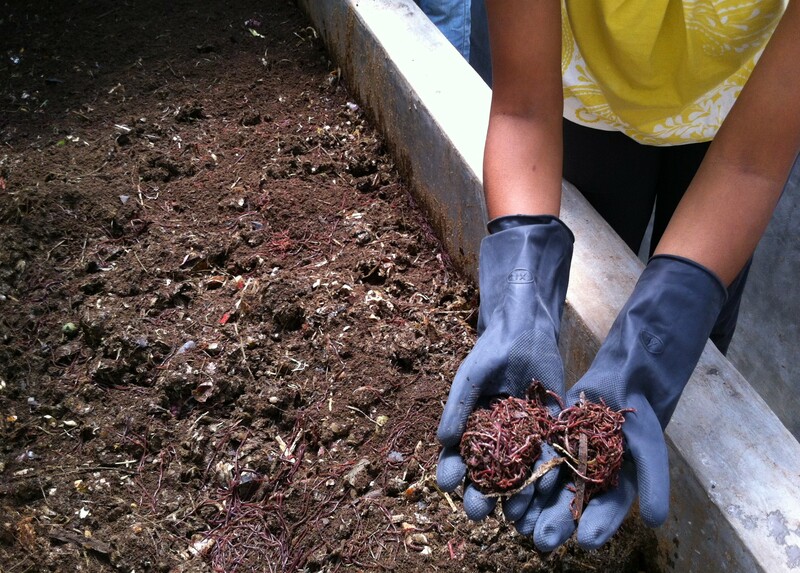 Note: Earthworms do not eat food items but feast on the microbes and bacteria that help organic matter decay. It is necessary to let the mix turn into semi-compost which is nothing but a bed rich with high microbial activity. Cowdung acts as a wonderful accelerator. The stage was set for sprinkling red wigglers which we bought for Rs 450/kg at GKVK. For a tank of our size, the expert said it needed nearly 5kgs of worms feeding on 5kgs of cowdung mixed with fully done compost they were already in. Involving residents, especially children, to introduce worms into the bed was fun and heart-warming. It felt as if a new chapter on sustainability in our tiny ecosystem had begun. ‘Going Organic’ is a series of articles based on my personal experience of turning our manicured garden, used to synthetic fertilisers and pesticides, into completely organic with the help of like-minded enthusiastic volunteers. 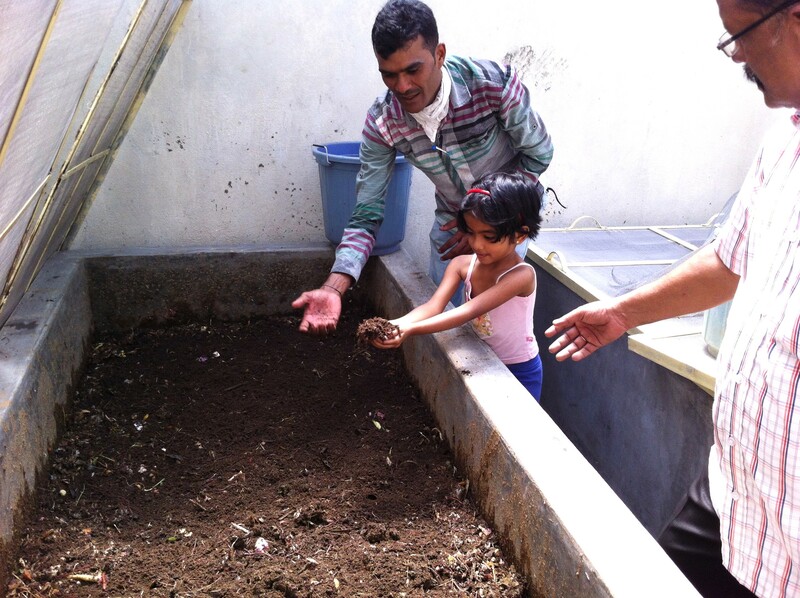 This entry was posted in Endlessly Green and tagged earthworms, large-scale vermi-composting in apartments, Sobha Althea & Azalea, vermi-composting, vermicomposting. Bookmark the permalink. If my understanding is correct, bit of care is involved in feeding earth worms (like citrus, onion peel etc need to be avoided). Is this correct? If so can you let us know how did you overcome those restrictions? You are right on what should not go into vermicompost bed. As you might have already figured out, this whole exercise was started by a composting novice (that’s me) and unsurprisingly, it took a completely different turn with the first experiment itself. I hope my next article will answer your questions. Ours is just a 202-unit apartment complex on an 8-acre plot. Our own workforce is quite capable of doing this work, and willingly, too. Whatever humans cannot do (like shredding of both kitchen and garden waste) is being done by a machine. Everything else has human touch. It is this involvement with the soil, the desire to enrich it through organic methods and seeing amazing results is what we are ultimately proud of. Hi, did you write another blog about vermi-wash? I could not seem to find. Thanks! !